Training isn't only in the gym but on the field or in the streets too. When hitting the outside make sure you're prepared in this Under Armour UA StormCyclone ColdGear L/S Compression Top in Academy and Royal. 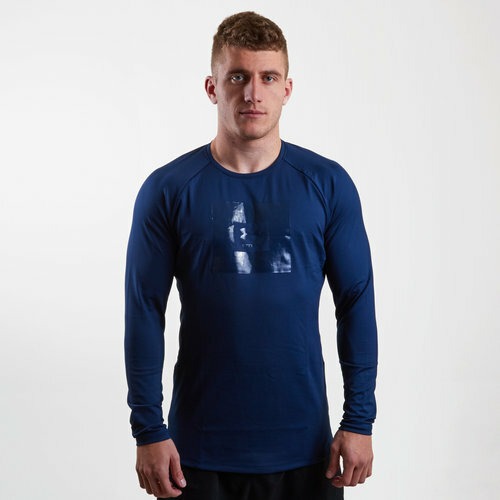 Training isn't always weather dependent so you too can work hard in the wind and rain in this compression top. The StormCyclone gear is built with lightweight, super water-resistant materials to keep you warm and dry whatever elements may come your way. This top comes in a next to the skin without the wearer feeling too squeezed in. The 4-way stretch construction means you can move better in all directions while the UA Storm technology repels water without sacrificing any breathability. The dual-layer fabric means this top comes with an ultra-warm, brushed interior and a fast-drying exterior. There is also zero-distraction shoulder seam construction in this top whilst the dropped shaped hem provides an enhanced coverage.